ROME (AP) — Roma wasted a three-goal lead and a chance to move into the Champions League places in a 3-3 draw at Atalanta on Sunday. A minute after Zapata had sent a penalty far above the bar, he scored the equalizer by finishing off a counterattack, extending his scoring streak to eight matches. The 27-year-old Zapata, who is on loan from Sampdoria, has 15 goals this season, one behind league-leader Fabio Quagliarella of Sampdoria. Roma is fifth, one point behind AC Milan, which drew 0-0 with second-placed Napoli on Saturday. Italy international Federico Chiesa scored twice as Fiorentina won 4-3 at Chievo in a wild match. Spal came back from two goals down for a 3-2 victory at Parma, with Mohamed Fares scoring the winner. 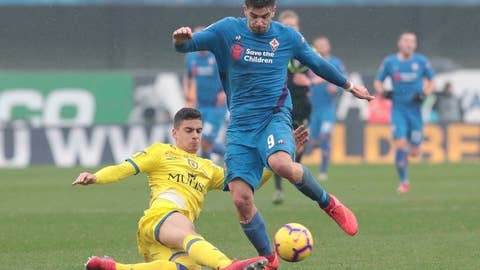 And in a meeting of two clubs in the relegation zone, visiting Frosinone beat 10-man Bologna 4-0 — putting Bologna coach Filippo Inzaghi’s job at risk.